Website and processes: 12 Dec 16 Faye, 5/5 Excellent "Super quick purchase, booked straight away on phone after paying and got the perfect date for a birthday surprise treat. Very excited, so fingers crossed the weather is good and we get up in the air! thank you for such a prompt response." 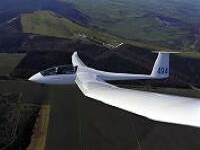 One of the best ways to see if you might like gliding is to have a trial lesson. Experience involves one or two launches, by winch or aerotow depending on conditions, and at least twenty minutes flying time during which you will be introduced to the characteristics of the aeroplane and the principal controls. The Club uses powerful Chevrolet-engined winches to launch the gliders to 1000 ft. or more. As our site is on a hill your actual height above the ground you are flying over will be around 2000 ft.